I first heard of it in an e-mail from an Internet correspondent named Marti, and immediately asked where this place was and how it got its name. From Marti: "According to a City of Burbank History, this was an area where the original airport was built by Lockheed in the mid-1920's. My dad was born in Burbank in 1913 and was raised on a ranch which encompassed the area where you lived (Lincoln St. at Victory). Part of that ranch became the airport land. 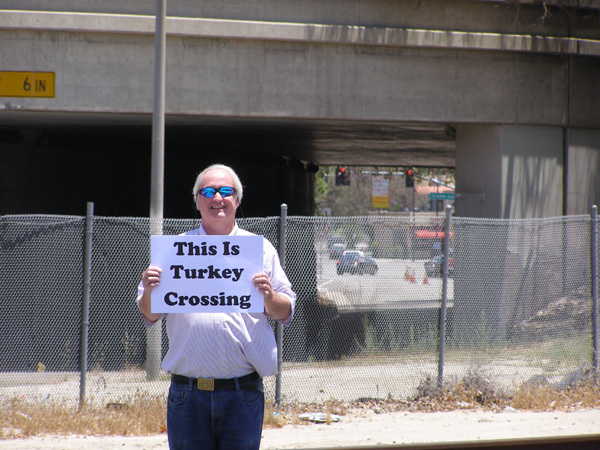 He and my mother, who spent most of her childhood in Burbank, were the ones who referred to Turkey Crossing as the area where San Fernando Road now goes under the freeway and the train tracks. During the War (World War II), there was a pedestrian underpass there for the workers to get to Lockheed without walking over the tracks. While this is fenced off now, it is still there." Okay, so know we know where it is - but why was it called that? The newspaper articles below from the Los Angeles Times tells the story. 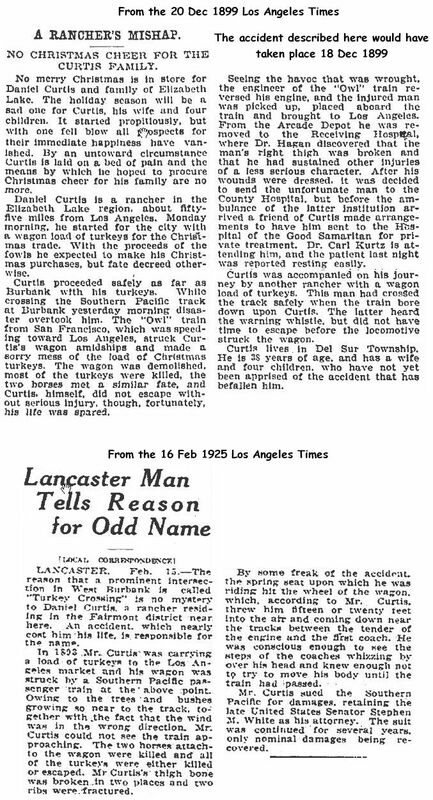 An interesting story - according to the 1925 article Curtis was apparently flipped under the train or right next to it and watched parts of it passing by overhead, and he retained a U.S. senator as legal counsel! So there you have it. 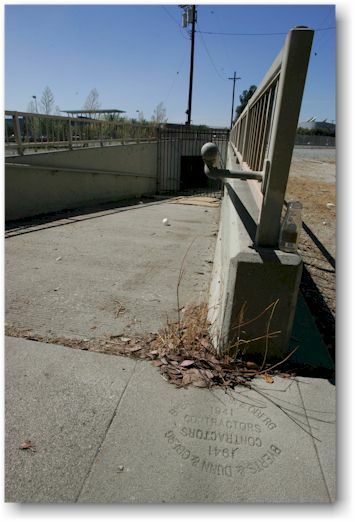 Near that bleak-looking underpass where the railroad intersects San Fernando Road was once a site where an odd, near-fatal accident occurred in 1899, hence, "Turkey Crossing." Click here for an L.A. Times article about a 1920 accident at the site. Note that the keys to the government liquor warehouse were reported as having been preserved, thank goodness. 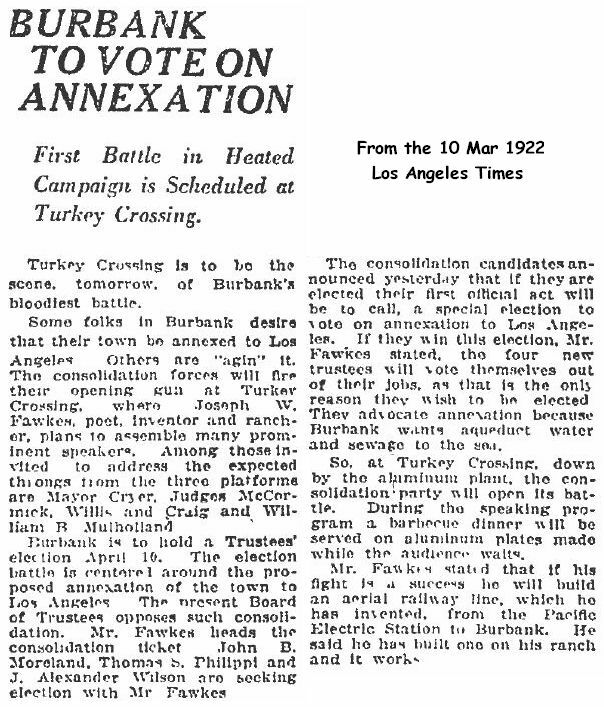 Click here for a 1922 L.A. Times article about what promised to be "Burbank's Bloodiest Battle" at the site (concerning annexation of Burbank to Los Angeles). Annexation advocate and monorail inventor J.W. Fawkes (a man who was no stranger to newspaper columns) is mentioned. 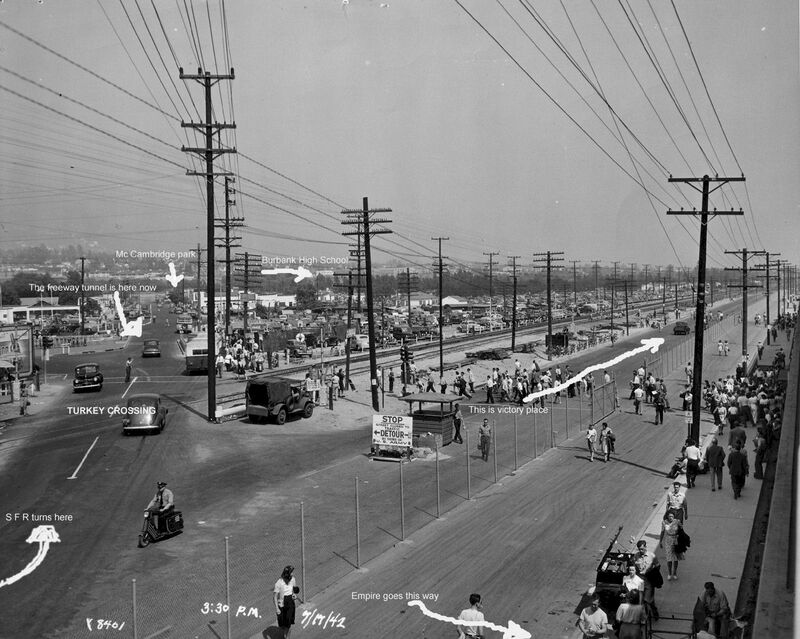 Click here for a 1924 L.A. Times article describing the intersection as "obnoxious." Click here for a cool photo of Turkey Crossing dated 17 July 1942. The annotations are by Mike. Lots of detail in this photo of the Burbank wartime military-industrial complex... I like the guy on the scooter at the lower left. The underpass entrance is where that group of people are on the right hand side. I think they emerge behind that black wall near the vee where the other gaggle of people are. Click here for an illustration from a 1954 booklet showing Turkey Crossing. Update 6/12/14: Turkey Crossing is about to disappear! As a result of the traffic improvement work Caltrans is doing - well, that's how it's being billed, anyway - the historic Turkey Crossing site is about to disappear. I understand the plans are to elevate the tracks at the intersection of the railroad and the old San Fernando Road site. Mike ventured out to document the spot before things got unrecognizable. There he is with the sign; his faithful daughter did the camera work. 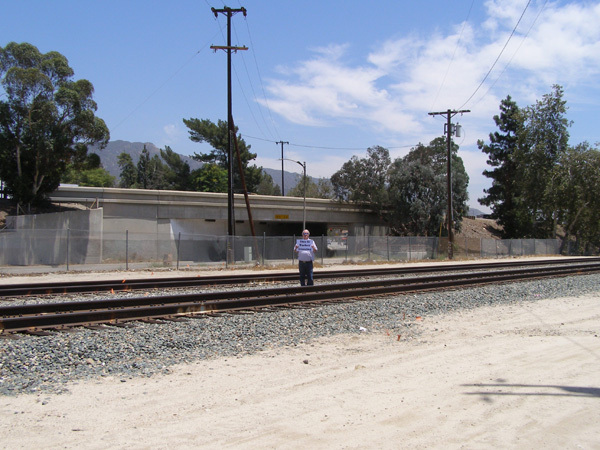 The way you find the historic site is to line up a position on the tracks so that you can see down San Fernando Road. In other words, continue the line of the road to where it intersects the tracks - that's the 1899 Turkey Crossing site. Same thing - wide shot. Do you think there's any support to get the City of Burbank to erect a historical marker somewhere nearby?